Bear Spray plays an important part in reducing attacks during human encounters with bears. It is an effective deterrent of North American bears, but it can be adversely affected by wind, rain, temperature, and even how close the bear is when it charges. When purchasing bear spray it is important to remember that pepper sprays (personal defense sprays) are not the same as bear spray. Although both types of sprays are made from oleoresin capsicum, it is the capsaicin and related capsaicinoids that are the active ingredients in bear spray. Therefore, if you see claims on a large can that state 10%, 20%, or 30% oleoresin capsicum, it is pepper spray (personal defense spray), not bear spray. The Environmental Protection Agency (EPA) regulates bear sprays pursuant to an Act of Congress. Look for the EPA registration and establishment numbers, usually found at the bottom of the front label; only bear sprays will have this information. Also, bear spray labels will clearly refer to bears, and state it is a bear deterrent, bear repellent, or for stopping charging or attacking bears. Currently the EPA requires that the concentration of Capsaicin and related capsaicinoids range between 1 and 2.0%. The variance in potency within this range is negligible, and all will affect the eyes, nose, throat and lungs of a bear. The minimum size can the EPA will register currently is 7.9 ounces, or 225 grams. Their suggested minimum spray distance they recommended was 25 feet. (Over 90% of those surveyed would have liked to have the effective spray distance to be further away, but 25 feet was the minimum they considered to be acceptable.) This is for situations in which a bear is charging from a distance. You want the spray to create as wide a barrier between you and the bear as possible so it has the maximum amount of time to affect the bear’s eyes, nose, throat, and lungs. Reserve spray for the hike out after a charge or attack. Bear spray is a good last line of defense, but it is not a substitute for vigilance and following appropriate bear avoidance safety techniques. Never intentionally approach a bear because you think you will be safe because you’re carrying bear spray. Never approach and spray a passive bear to try to get it to leave the area. Bear spray is only meant to be used on charging or attacking bears. If a bear charges you from a distance, spray a 2-3 second burst in the direction of the bear, pointing the canister slightly downwards and spraying with a slight side-to-side motion. This distributes an expanding cloud of spray that the bear must pass through before it gets close to you. Spray additional bursts if the bear continues toward you. Sometimes just the noise of the spray and the appearance of the spray cloud is enough to deter a bear from continuing its charge. Spray additional bursts if the bear makes additional charges. If you have a sudden close encounter with a bear, spray at the front of the bear (because of the expanding cloud, you don’t have to take the time to try to aim carefully at the face or the eyes). Continue spraying until the bear either breaks off its charge or is going to make contact. If it is a grizzly bear and it’s going to make contact, drop to the ground and play dead and give the spray time to take effect. 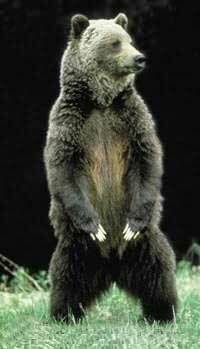 If it is a black bear, prepare to fight aggressively with any available weapons (fists, sticks, rocks, etc.) until the spray has time to take effect. Bear spray has been shown to reduce the length and severity of maulings. Do not use bear spray to chase animals out of your yard. Call your local wildlife management agency to assist you.